Myntra is a popular online company that focuses primarily on lifestyle and fashion products in India. Its initial purpose was to serve as a place where you can personalize different gifts, but it had expanded and now works as a platform for selling branded clothing. Since the middle of 2015, Myntra shifted towards working only as an application, where the clients can buy and sell at the website by using smartphones and other mobile devices. The reason for that is because the majority of users are using the application on their phones, and rarely on desktop. You can also log-in at Myntra with your Facebook or Google accounts. The application is easily installed and you can browse through thousands of different fashion styles and pick between couple of thousand well known brands. Here you can discover all the latest and most popular lifestyle trends, and search for different pieces of clothing such as shirts, shoes, jackets, blouses, dresses or jewelry. 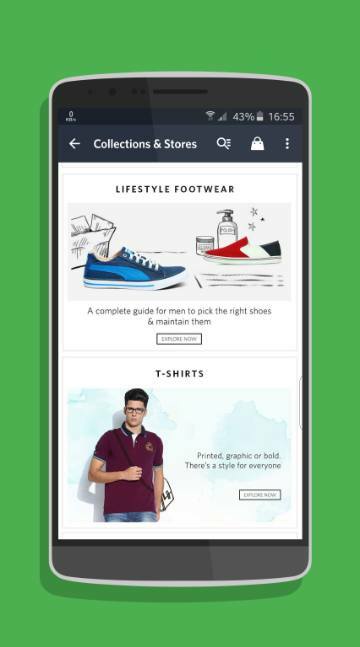 With the Myntra application, you get an instant access to many free fashion tips from professionals, as well as deals, discounts and offers on numerous stylish products. Myntra offers a unique experience for shopping, and one of their best features is that it offers free delivery and 30-day money back guarantee. That is major advantage in comparison with other similar platforms. Cash-on-delivery is also convenient and handy options, and you can pay your product upon delivery. Myntra`s collection of fashion products is separated in different categories, and the access is really easy regardless whether you are searching for men`s, women`s or children`s clothing. Men`s apparel includes different stylish suits, shoes, sneakers, watches, shirts, bags, sunglasses or sandbags. They also have a decent collection of wallets, blazers and bracelets. Women`s apparel includes sarees, dresses, handbags, trainers, different types of underwear, night dresses, scarfs, tops, as well as jewelry. Kid`s apparel includes sandals, dresses, earrings, shoes, school bags, boys shoes and t-shirts. At Myntra you can also find lots of quality brands such as Adidas, Boss, Casio, Diesel, Fila, Lee Cooper, Nike, Puma, Ray-Ban, Reebok, Timberland, Tommy Hilfiger and many more. Myntra app is extremely easy to use and you can search through huge collection of accessories for any gender and age range. You also have an option to set your search based on your specific requirements about the product such as price, size, color or popularity. Search filters work great, so you should use them. Myntra also offers coupons and you can add them straight to the application. You can also get alerts about the latest offers and deals on your smartphone. Another interesting option is that you can save some products for later by storing them in your wish list, directly from the application. Beside every item at Myntra you have detailed information about the product, together with a few photographs and explanations from fashion experts. Regarding the payment options, payment is always fast, safe and secure and it includes debit and credit cards, net banking and cash on delivery. The delivery is quick, it arrives on time as promised. 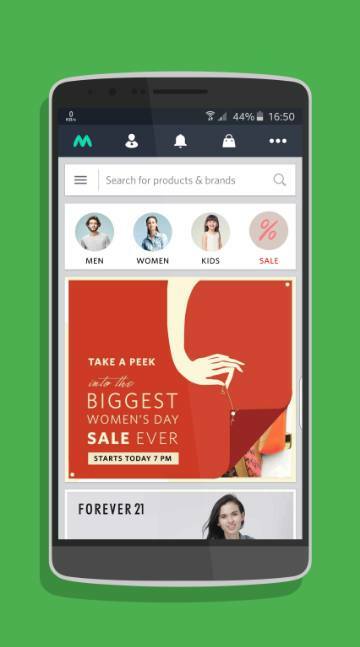 Here you can download Myntra for your Android device to start shopping branded fashion products in easy way.